This book is *completely* different from my usual choice of books, but perhaps that is why I enjoyed it so much. Just a darned good story based on a real life event and set in Victorian times. (Bliss.) Crichton has so much talent in his little cells that he just makes the rest of us look bad. Sigh. I had picked up this book initially thinking it was non-fiction about the Great Train Robbery of 1963 which occurred close to where I grew up in England. 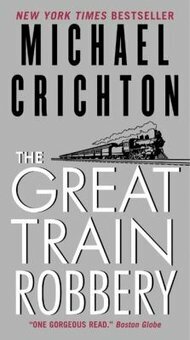 However, this was about another earlier Great Train Robbery in 1855 which also netted a big haul for the criminals and made the news, and the manner in which Crichton writes, made it all so exciting to read. I just whipped through this book just because it was so riveting a narrative. The story starts from the beginning introducing the reader to Edward Pierce, the well-dressed and intelligent mastermind behind the crime. Along the way, we are introduced to other members of this gang, each with their own speciality in the criminal world: a locksmith, a man who can get through small spaces quickly, shady contacts in the industry… I think Crichton quite admires Pierce in some ways: his smarts, his ability to cross social class boundaries on all levels, his quick thinking. Crichton is also not shy about showing Pierce’s arrogance which can get him into some sticky situations, which, if he had known better, he would never have done. But this made it all the more exciting as you, the reader, knew the inside scoop and what the odds were. Crichton really knows how to write a cracking good read: chapters were short enough where it was easy to think “ok, just one more before I go to bed”, and quickly get sucked into the next one. There were a lot of characters but Crichton didn’t introduce them all at once, so you got to know them well along the way. And the narrative was just so exciting – honestly. Lots of action, the different personalities involved, and then the role of the police (who were quite a new concept back then). Remember – there were no finger prints, no DNA, not much photography… None of the tools that help PDs today, so tracking down the criminals was a lot harder and much more time-consuming.